A trio of adorable snow leopards was recently caught on camera snuggling and relaxing beneath a shady tree near a monastery. The rare and elusive creatures were photographed in Qinghai province, in central China, using camera traps placed by Panthera, the global wild cat conservation organization, the Snow Leopard Trust and Shan Shui Conservation Center. China contains about 65 percent of the snow leopard habitat, according to Panthera. The footage was captured outside Zhaxilawu monastery; the camera trap was placed there because the area had been a hotspot for wildlife, with a wild bear and another snow leopard spotted in the previous weeks. 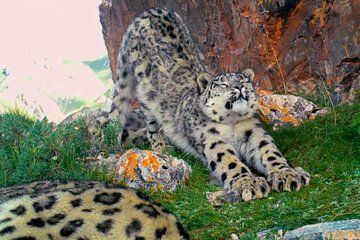 Tibetan monks have also been recruited as snow leopard allies, with monks patrolling the areas where the snow leopards prowl to prevent poaching, according to a 2013 study. Though it's hard to tell from the video alone, the trio may be siblings, or possibly a mother and her two cubs, scientists from Panthera said. In the video, they roll around, yawn, stretch their feline limbs and nuzzle each other, before pausing to investigate the camera trap. Snow leopards (Panthera uncia) are elusive cats that live in the forbidding, mountainous terrain of Asia, from Russia in the west to China in the east. Their white-speckled fur allows them to blend in with their craggy mountainous habitat, while their thick padded feet allow them to tromp silently but sure-footedly in the snow, hunting for prey. About 4,000 to 7,000 snow leopards remain in the wild, according to Defenders of Wildlife, and the regal felines are listed as a threatened species by the International Union for the Conservation of Nature.